Something for the boys! Yay! I got this sweater vest at the Dollar Store several days ago (sweaters at the Dollar Store? How random is that??) and I just knew it was dying to be a little beanie and scarf set! I'm so excited to have a project for little boys! 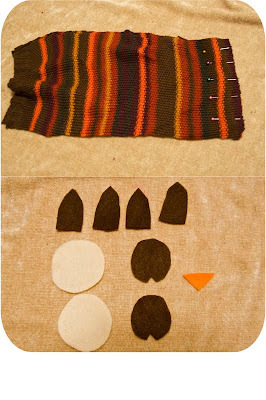 1) Measure your child's head, and cut out a hat shape through both layers (I free-handed this, but if you had another beanie to trace around, that would be great! ), then cut a large rectangle shape through both layers for the scarf. 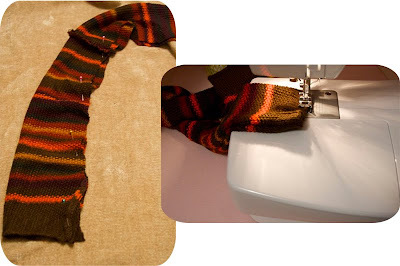 2) Lay the two scarf pieces right side together and pin the non-banded end. Sew with a zig-zag stitch, being careful not to let it stretch too much. 3) Cut out your "face" shapes from felt or fleece. 4 ears, two big circles for eyes, and two slightly smaller circles for the pupils, and a little triangle nose. 5) Pin the ears to the right side of the beanie, facing downward. 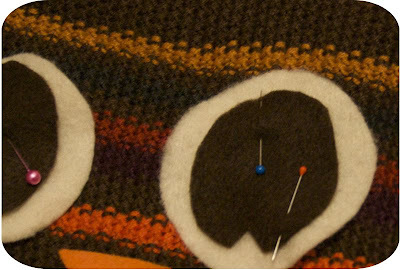 Lay the other piece of the beanie on top of it(right sides together), with ears sandwiched in between, and pin. 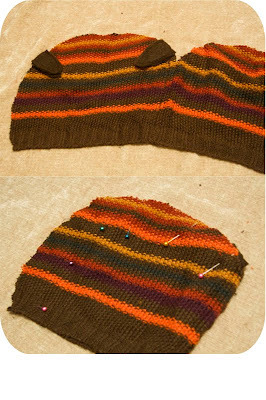 6) Sew the two hat pieces together, leaving the banded side open. 7) Take your scarf piece and fold it over, right sides together, and pin. Sew all the way down the side. 8) Turn the scarf right side out, and sew the banded edges closed. 9) Pin the face shaped where you want them, and hand stitch them on. My model had already gone to bed for the night, but luckily she's a heavy sleeper! OMGoodness! Adorable!!! I love that you're able to dress her while she's sleeping. :) What a creative refashion Disney! You're awesome!!! It's adorable and thank you for sharing! O this is very cute! I was blessed with having three girls so I don't have the "I kind find cute stuff" problem ,but my sister has a little boy and she would love this too! I can't wait to show her! YOU! are a genious! :) LOVE it! and what a precious model you have. I love it! Perfect colors, love owls . . . just love it! Great job! Oh my goodness!!! That is the most precious thing ever!!! and your sweet angel/model sleeping!! Priceless!! Thank you for a great boy idea! I have 2 boys and 1 girl and I feel so guilty that I can't come up with cutesy ideas for them! Oh that's so cute! Found you via SITS. Thanks for sharing! Very nice. This will be perfect since I have two boys. SO cute!! I think I may have to do this for my litle guy. 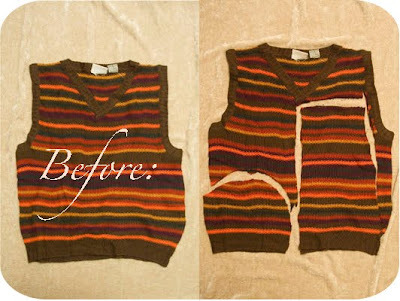 Our dollar store isn't that great, but maybe an old sweater from Goodwill.Thanks for sharing!You are so brilliant! Very cute!! Might make them for our boys AND girl!! 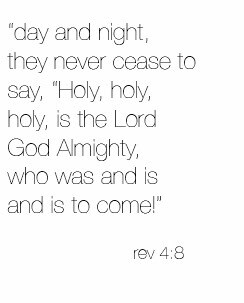 oh gracious! that is FANTASTIC!!! 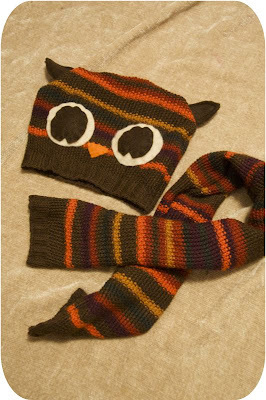 I love owls, and I love repurposing things I find at Goodwill, AND I love crafts that I can use for my little boy. Oh my goodness that's so unbelievably adorable!!! Too funny! I can't believe you did all that to her and she didn't wake up...I love it! And I'm so glad you have something for the boys. My sister in law will be so happy! haha! this post cracks me up! don't get me wrong, i love the idea and the design... that is not at all why i am laughing. the fact that you had your daughter sleep-model is killing me! lol! SO cute! That is so ADORABLE! 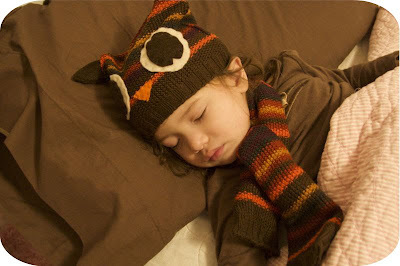 My 4 year old loves owls, so I will definately be making her one of these. I put hats on my sleeping son too, ha ha! I am so going to do this project. Thanks! oh! that is soooooo adorable! ooooo love it love it! :) this is a saved project! thank u! That is the cutest thing ever. Love it! Very Cute & Creative! I'll be stopping by my Dollar Tree soon 4sure!! Huh, so it's not just my Dollar Store that has old used sweaters right now? I walked into mine the other day and there was a display right in the front! Most were pretty ratty but I did buy two wool sweaters to felt--for a buck, that's cheaper than the thrift store! I LOVE this idea--can you tell me which dollar store you got the sweater from??? 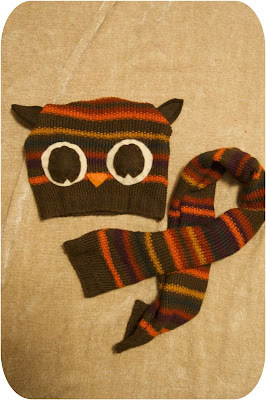 my daughter is so into owls right now--i would love to make this for her --the colors are perfect!!! That's too adorable and so's your daughter. And it's funny about the sweaters in Dollar Tree. I noticed what looked like used sweaters in mine a couple of weeks ago also. Ind hoe there's may go back now a decent to upcycle. Thanks for the tutorial and love your blog! I love this idea. Thanks so much for sharing. Your kiddo is ADORABLE!! I found this craft, and I was so thrilled to finally get to make something for my son (my daughter has a trunk full of crafts I have made/sewed for her!). I made mine today and was able to do it even with hand sewing (both machines broke on me this month) and it turned out darling. I didn't have a left over sweater, but while thrift store shopping I came across a knit brown boys shirt and I think it did the trick. And, I hated to waste the rest of the shirt, so I made a stuffie to go with it! Thanks again for the idea, and I have passed it along on my recently started craft blog! Wonderful idea! Well done! Thank you!